If you’ve been following me on Twitter, you know that me and my colleagues had a great time at the AP Conference in Austin. Fantastic food, people, and educational resources. Over the next week, I will be posting information and reviews from the conference. The first official AP post is a guest review from Jason Nisavic, a high school Social Studies teacher (and fellow Comic Book Teacher). 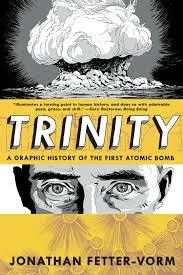 We ended up picking up a ton of non-fiction graphic novels at the conference to preview for possible use in our classrooms, and Jason has agreed to do the review on Trinity: A Graphic History of the First Atomic Bomb by Jonathan Fetter-Vorm. Here is a link to a YouTube video of Fetter-Vorm describing his process. I suggest watching this short video before reading Jason’s review which begins immediately after the link, enjoy! 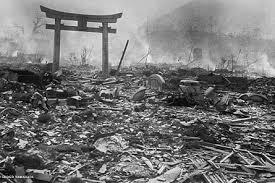 Nuclear weapons first dropped into our homes and minds on the morning of August 6th, 1945, and they’ve never left. Their existence can’t help but define us. We see their influence in some of our most captivating and terrifying films. 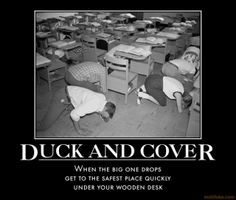 Thousands of homes still have concrete bomb shelters that have long since been converted into storage space or extra bedrooms for post-recession 30-somethings. When we hear news about rogue nations around the world trying to gain access to destructive nuclear technology, it holds our attention almost as well as a movie star’s wardrobe malfunction. Nuclear weapons can end humanity in the course of any given hour, and most people know almost nothing about them. For example: how much Uranium-235 would it take to build a nuclear weapon like the one that devastated Hiroshima, Japan? In all seriousness, try to get a mental picture of exactly the amount. What did you picture? A house full? A Truckload? …it’s actually not even enough to fill a shoe box. The graphic novel provides a multitude of chilling facts and figures about nuclear weapons like the one above. For a person with their finger on the pulse of international diplomacy, this book can cause quite a few sleepless nights. For a U.S. or World History teacher in need of engaging reading material for their students, this book provides an invaluable service. History classrooms can be sterile places, and humanity’s many struggles can seem hollow when pressed between the pages of a book. Sure, summaries and pictures can convey how something happened while primary sources and dramatizations can provide a clearer picture, but few and far between are those pieces of media that allow us to truly feel history in action. Fetter-Vorm’s graphic novel performs this task admirably. Trinity starts ambitiously and delivers from start to finish, weaving personal stories of key people involved with the Manhattan Project with the scientific principles of nuclear weapons to give us a very intimate and fast-paced view of the arms race. From an educator’s perspective, the book covers a great deal of material very efficiently. In the short span of the first 15 pages, I had learned about the history of radiation research, the science of nuclear fission (and its destructive potential), the immediate necessity of racing to build a bomb in World War II, the political intervention of Albert Einstein, and the origins of the Manhattan Project! For a person such as myself, sporting more of a “humanities” brain than a “math” brain, I found the descriptions of the science simple and illuminating. Fetter-Vorm seems to be aware that his audience could well consist of freshmen or sophomores in high school, so he uses accessible imagery in his explanations. The metaphor of atoms as dominoes makes understanding fission a matter of child’s play. 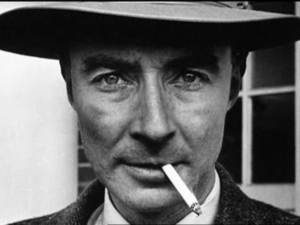 Of particular interest to Fetter-Vorm is the lead scientist behind the effort, J. Robert Oppenheimer. Throughout the book, Fetter-Vorm takes care to connect us with Oppenheimer as he grows from precocious college prodigy to struggling research coordinator to “Death, Destroyer of Worlds.” As someone who is no stranger to World War II, it was still an eye-opening experience to see Oppenheimer as painted here; a science-obsessed pioneer who ultimately became haunted by what he had accomplished. A cold, jarring conversation with President Truman following the war’s end lets us see a man who realizes that he has released a genie from a bottle the likes of which has never been seen before. The book flows well, averaging about 100 words per page. Although it might seem a little daunting at the start, things eventually loosen up and the art begins to play a much larger role in telling the story. My favorite moments were the ones that needed no explanation. Fetter-Vorm lets the words fall away almost entirely to let the truly momentous and horrifying moments speak for themselves, reminding us in universal language exactly what our science has unleashed upon humanity. With elegant clarity and conversational nonchalance, Fetter-Vorm shows students of history that World War II led directly to the last possible escalation of human warfare. The closing pages of the book leave us feeling hollow and sober by reminding us of the laughable and literally MAD coping mechanisms we have developed in the time since to defend against such horrid tools of war. Reading this book will not leave students feeling joy; pondering the specifics of nuclear annihilation rarely leaves a person in high spirits. However, for a teacher aiming to communicate the human-side of the nuclear struggle without sacrificing content, it is an excellent resource. Trinity can (and should) find a place in any U.S., World, Civics, or Government classroom as a conversation piece.